Android is now a well spread Operating System (OS) for mobile devices. This article is to describe the history, the important milestones, devices and applications. Android is an open OS based on Linux kernel and is free to use and to modify; integrators (HTC, Motorola, Samsung) created their own interface of the OS to differentiate themselves. The icon of Android is the little green robot named Bugdroid. The development of Android is a colaborative work between Google and the others members of the Open Handset Alliance. 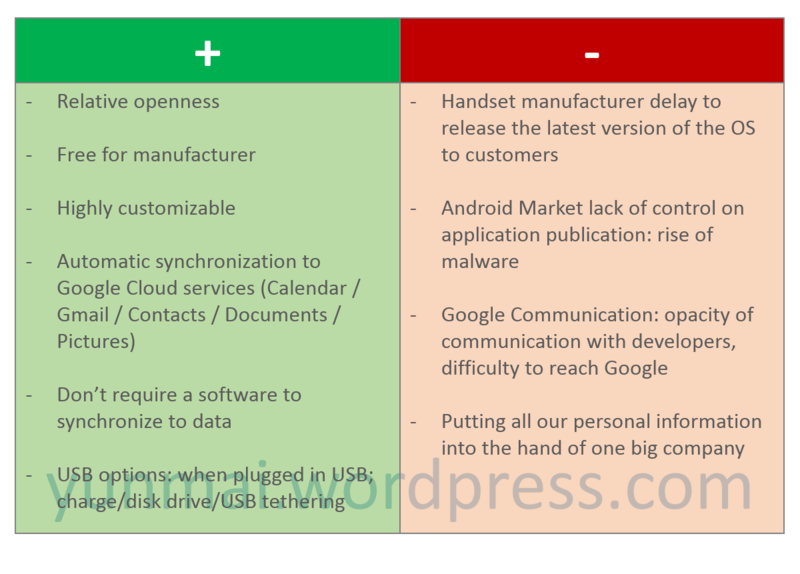 For more details on the technical differences of the different version of the Operating System Android, please refer to this well documented wikipedia page Android version history. Due to a free entry for the distribution of devices, Android has been adopted by numerous companies: HTC, Motorola, Samsung, Huawei, Lenovo, Dell … and it’s now use in a lot of different devices: watches, mp3/mp4 player, mobile phones, tablets, TV and cars. Samsung took over the first place of mobile phone manufacturer to Nokia by the rising of Android and Smart phones. 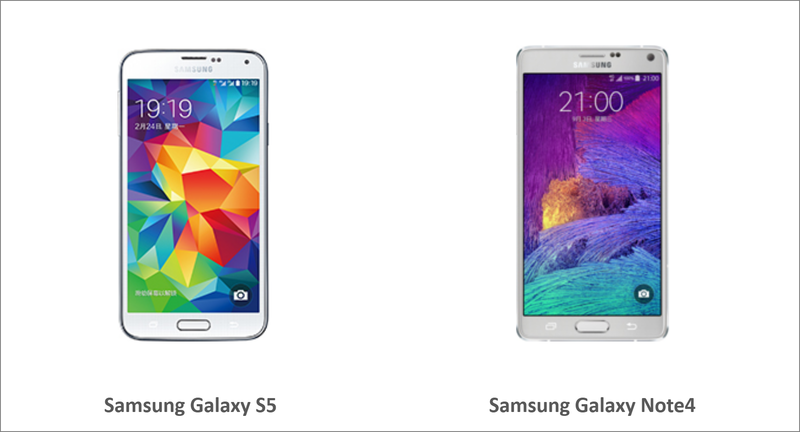 The most noticeable mobiles are from the Galaxy series, the Galaxy S1, S2, S3, S4 and now S5 have been well received by the users. It’s also interesting to notice than while Apple was selling 4” screen devices, Samsung introduce the “Phablet” (concatenation of Phone and Tablet) with the Galaxy Note and it’s huge 6″ screen. HTC has been a time the preferred devices for “Geeks” because of the unlocked boot loader which allow to side load custom kernel and ROMs. HTC famous devices includes HTC Desire, HTC One X and HTC One. LG had partner 2 times with Google to provide Nexus phones, some of their acclaimed phones include the LG G3. Sony joined the Android experience on the late. The mobile phones were appealing because of the IP63 protection rating (waterproof, dustproof). Sony top sellers include the Sony Xperia Z1, Z2. Chinese manufacturers are now taking a big portion of the Android Smartphones sales: XiaoMi, Huawei and Lenovo are really aggressive on the market and are taking shares from the “traditional” manufacturers. 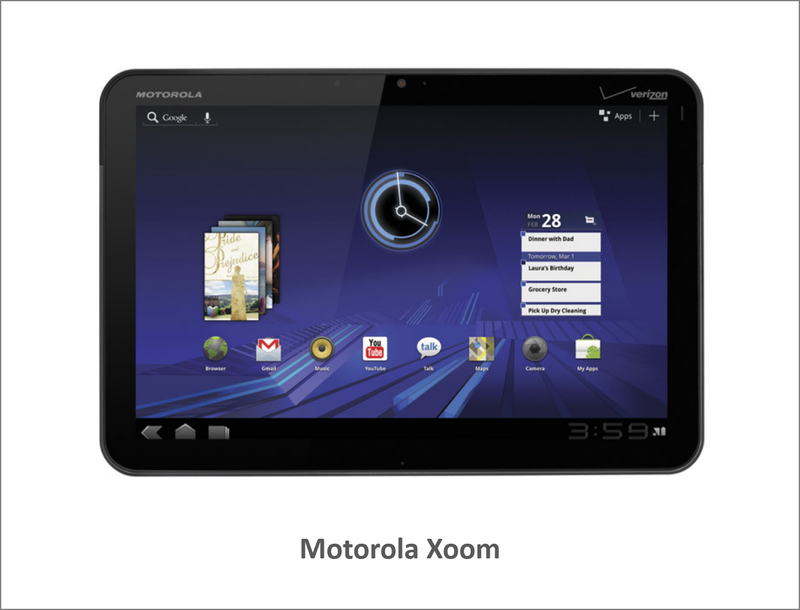 Motorola Xoom, HP Touchpad (originaly release on WebOS), Samsung Galaxy Pad, Asus Transformer, Dell Venue, Nexus 7, 10 & 9. The official Android TV had been announced in June 2014. Android TV can be built into both TVs and standalone set-top boxes. Users will have access to the Google Play Store to download Android apps, including media streaming services […], as well as games. The platform emphasizes voice search to quickly find content or answer queries […]. The TV interface is divided vertically into three sections: recommendations on top (which update based on viewing habits), media apps in the middle, and games on the bottom. The interface can be navigated using a game controller, remote control, or the Android TV mobile app. Android TV will also support Google Cast, the technology behind Google’s media player Chromecast that allows a mobile device to be used to select and control media playback on a TV. Wikipedia. Asside the official Android TV solution, it’s possible to find on Internet some TV box running on mobile devices hardware with a remote and an HDMI output to directly connect it to your TV set. In 2014 Google release a version of Android for wearable devices; the three first devices are the LG G Watch, the Samsung Gear and the Motorola 360. The main problem found is the lack of real autonomy, with a battery limited to one day of normal use. Announced in June 2014, Android Auto is part of the Open Automotive Alliance. On top of this device and to show to manufacturer which way Google wants to go on the devices, they released since 2010 their own devices under the Nexus brand. They associate with manufacturer to provide the cutting edge of technology to Phones and Tablets. It’s also interesting to notice the existence of the Google Nexus Q which is a device to connect to speakers and stream your music to. Android OS comes with a integrated Application market that allow users to search and browse, view, rank and comment, the ever growing number of applications. Even if android market exists since october 2008, the website interface as been released only the 2nd february 2011. Since more people know Google than Android, Google changed their strategy about their app market; in 2012, Android market changed to Google Play. The Android market app evolves to become more visual appealing and to highlight applications. The web interface of Android Market allow you to search, compare and install applications directly from your computer. If you are connected with the same account as the one set on your android device, the installation of app will be automatic the next time your phone has a Wi-Fi connection and a notification will appear if you cannot install it on your device. Your different devices are also listed, as well as your previously downloaded applications. Like most of the OS in the industry, Android evolved from to a flat design. The latest iteration on the design is called “Material design”. If you are interrested in the guideline you can check this dedicated website from Google: Material Design. The android platform already incorporate different applications from Google. Mainly all Google cloud applications are available directly from first launch: Google Calendar, Google Gmail, Google Contacts, Google Search, Google Keyboard, Google Messenger, Google Hangout, Google Voice search, Google Maps, Google Music, … If you already use a Google account, everything previously setup will be automatically sync to your android devices. In its few years of existence, Android manage to take a healthy market share into the world of the mobile OS. Symbian lost most of their previous supporters and (Sony and Nokia), Apple with iOS manage to draw the direction of the smart phone development. The strongest point of Android is that they manage to bring a full community of supporters, developing alternative ROM, replying to problems, adding support of last version of the OS to devices not yet updated officially. The Android platform is not exempt of problem: since few months some developers are complaining about App missing (Android Market app missing issue), and back in April 2011 Apple and Google where pointed for tracking customers behavior. Furthermore the Android market has been infected by malwares due to the lack of control as opposed to the steel-hand of iTunes. For more details about the technology and the different layers of Android I can just recommend the Android developers channel on YouTube and more specifically this series of video (Android Architecture). Thanks for reading this page. In Annexes you can find some of the links to article and infography which helped me to write this page. Putting your personal information information in the hands if a big company? People do that with the government and other corporations such as Apple and AT&T. Thank you for reading this. It’s an ongoing article so many things could be added on Android subject. Concerning personal information its more of a reminder that privacy is not something acquired, and you are correct that people already give their info to others companies or government entities. But isn’t it necessary reminding it?